FILE - Police remove a fence to facilitate traffic flow near Wat Phra Dhammakaya temple in Pathum Thani province, north of Bangkok, Thailand, Tuesday, Dec. 27, 2016. The Thai military government, in a test of political resolve, is in a standoff with monks from an influential Buddhist temple that has placed religious politics at the center of national debate. The Wat Phra Dhammakaya temple complex, located 50 kilometers north of Bangkok, covers 336 hectares, has a series of buildings and meditation centers reportedly worth an estimated $10 billion. Authorities are searching for the temple's abbot, who has eluded arrest on charges related to millions of dollars in embezzled funds that were donated to the temple. 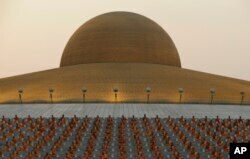 The Dhammakaya temple, one of the most influential in Thailand, attracts tens of thousands of devotees with mass meditations and ordinations of monks, as well as reaching devotees elsewhere in Thailand and overseas. Thai Buddhist monks pray and gather at Wat Dhammakaya temple in Pathum Thani, Thailand, Feb. 22, 2016. 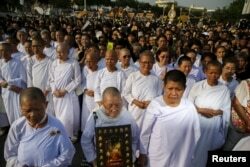 Analysts say the temple has become a battle for influence over Thai Buddhism, the religion of over 90 percent of Thailand’s 68 million people. The temple’s considerable influence, including within the Buddhist hierarchy, is seen as challenging Thailand’s more orthodox Buddhist community, say analysts. In the past, the temple’s monks have called for Buddhism to be recognized as a national religion within the constitution, a move resisted by past governments. The charismatic abbot, Luang Por Dhammajayo, 72, and the temple’s considerable wealth have also drawn criticism. Devotees are reported to donate large sums to the temple to gain ‘merit’. Controversy caught up with the temple after a devotee, a senior member of a credit union, embezzled $344 million, and donated $42 million to the temple. The credit union official is serving 16 years in jail over the theft. The temple says it has repaid the credit union cooperative a total of $30 million in cash and checks. But Thai authorities say Dhammajayo must face charges linked to the payments as well as other charges. In 2016, the government issued arrest warrants for the abbot who has avoided arrest, refusing to surrender to authorities. 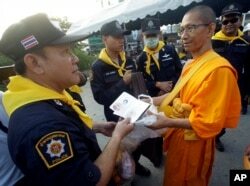 A Thai policeman checks identity card of a Buddhist monk of the Dhammakaya sect temple for security outside the temple in Pathum Thani, north of Bangkok, Thailand, Feb. 22, 2017. The abbot’s legal team has told local media he was unaware the donations came from the embezzled funds. The government, applying powers under the interim constitution that grants Prime Minister Prayut Chan-o-cha wide powers, has stepped up efforts to search the complex. Hundreds of police and officials have been sent to the complex, where they have involved themselves in a stand-off with lines of monks and supporters. Gotham Areeya, an advisor to Mahidol University’s Institute of Human Rights and Peace Studies, said the stand-off is part of official efforts to “reform” Buddhism and reduce Wat Dhammakaya’s influence. “[The Buddhist establishment] think the way Dhammakaya is expanding, creating more and more followers, not only in this country but outside as they are very skillful administrators – they can organize the ordination of 100,000 monks. So it’s a powerful organization behind it with a lot of money,” Gotham said. A strategy of mass ordinations and ceremonies has attracted tens of thousands of supporters, including powerful politicians, bureaucrats and the business community. But the temple’s influence has also generated divisions within the Buddhist religious community. The temple, observers say, has sought to extend its influence into the body of monks that oversees Buddhism in Thailand as well as the National Buddhist Office. In 1999, the then head of the Buddhist clergy, Supreme Patriarch Somdet Phra Nyanasamvara Suvaddhang, who passed away in 2013, accused the temple of distorting Buddhist teachings, creating conflicts and moved to have Dhammajayo defrocked. It was also ruled he was required to return all the property and money earned during his time as a monk. FILE - Nuns and people take part in a procession with the royal carriage containing the remains of Thailand's Supreme Patriarch, Somdet Phra Nyanasamvara Somdet Phra Sangharaja, during his cremation ceremony in Bangkok, Thailand, December 16, 2015. But the military government, in power since 2014, has moved to counter the influence of the temple, including within the Buddhist hierarchy. The appointment of a new Supreme Patriarch, Ariavongsagatanana, came after legal changes that granted new Thai King Maha Vajiralongkorn the right to select the head of the Buddhist clergy. The appointment overruled the earlier selection of a senior monk reportedly with close ties to Wat Dhammakaya. In a further move, Thai Prime Minister, Prayut Chan-o-cha removed the National Buddhism Office’s chief, who was replaced by a member of the Justice Ministry’s Department of Special Investigation (DSI). Prayut also ordered the military and police to further search for the temple’s abbot. Buddhist groups have been calling on the government to revoke the order. But Thai Deputy Prime Minister, Prawit Wongsuwan, said the government is determined to press ahead with the search. “The search [for the Abott] will continue no matter how many more weeks or even if a year passes … authorities are trying to avoid violent confrontations. But it is necessary to continue to enforce the law,” Prawit told local media. Buddhist monks and devotees sit outside the Wat Phra Dhammakaya temple in Pathum Thani province, north of Bangkok, Thailand, Thursday, June 16, 2016. Panitan Wattanayagorn, a political scientist and advisor to Prawit, said an offer had been made to Dhammajayo to present himself in court and “fight the case,” but this was rejected. “So the government is not in a position to back away from implementing the law. There were attempts to make sure [of avoiding] consequences erupting from moving forward on this legal challenges,” Panitan told VOA. He said the government aimed to avoid a violent confrontation. “[The officers] must engage peacefully and they must make sure that there is a solution that most people can accept,” he said. Mano Laohavanich, a former senior monk at the temple, who fell out with Dhammajayo's teachings afer 17 years, believes the abbot is still in the temple complex and has avoided capture so far. "I don't think that the stand-off will be that long - maybe a week or two that is the longest time. Security officers have to disperse the mob at the local market place in protest of the government. And then they have to remove the power lines to the temple - so that's how they are going to do it," Mano told VOA. He said the government still has the upper hand in the confrontation and there is no way for the abbot to escape. Attayuth Bootsiripoom, an editorial writer with The Nation newspaper, questioned the "legitimacy of sending thousands of police and military officers to hunt for a monk who has, after all, been accused of gross misdemeanors rather than serious crimes."